Pricing is based on simultaneous calls (SC). If you require more or have any questions feel free to contact us. Can I use 3CX on my PC? 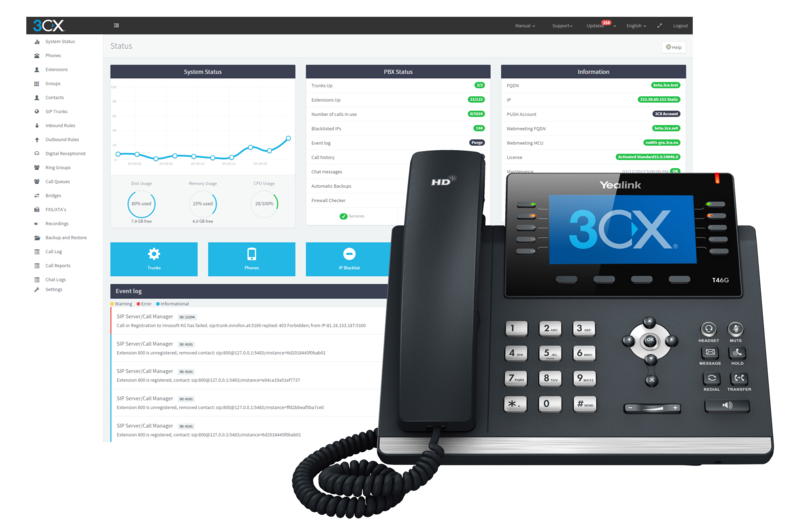 3CX Phone System includes a client (available for Windows, Mac, iPhone and Android) that makes call control, conferencing and other unified communications features a breeze. Users can manage their extension and their calls with just a few mouse clicks and avoid using a cryptic phone interface. What’s more, you can log in to 3CX from any computer or smartphone to see the status and presence of other users from your office and any bridged offices around the world. Can I use 3CX on my smartphone? Private Universe can host your PBX in the Cloud and offer all the features of the 3CX Phone System, without the overhead of managing it yourself. Private Universe hosts your PBX in the Cloud and offer all the features of the 3CX Phone System, without the overhead of managing it yourself. You can retire an old onsite PABX, saving space and electricity at your premises. You will need some new VoIP handsets or you can use the software based VoIP client on your desktop computer with a compatible headset. Backup of the phone system is handled without the need for any interaction on your part. All maintenance of the phone system itself is handled by Private Universe as part of the monthly charge. The phone system is completely independent of your office hardware and network connection, so any outages at your end will not affect the availability of your phone system. The system is hosted in our Sydney based, Tier 1 Data Centre. This data centre has multiple levels of redundancy and offers the highest level of availability to you. Our hosted solution pricing for 3CX Server Standard Edition is as follows. 3CX Phone System 4SC – $169 ex. GST per month. 3CX Phone System 8SC – $269 ex. GST per month. 3CX Phone System 16SC – $399 ex. GST per month. 3CX Phone System 32SC – $649 ex. GST per month. Inclusions with these plans (beyond the usual 3CX features) are as follows. Call charges are not included in the hosting charge, and will be billed separately. Porting existing numbers into the VoIP system will be charged separately. Hosting DIDs will be charged separately. Additional handsets not supplied by Private Universe will attract a $50 ex. GST provisioning charge. If you have any specific questions on 3CX or related hardware/services, please contact us to discuss your individual requirements. Private Universe have partnered with 3CX since 2008. We have supplied and installed hundreds of 3CX IPPBX Phone Systems throughout Australia and internationally. Private Universe can host your PBX in the Cloud through its PBX Blue brand, launched in 2017. We will host your PBX in the Cloud and offer all the features of the 3CX Phone System, without the overhead of managing it yourself.